If we understand what is damaging coral reefs, we can save them. White band disease is responsible for destroying up to 95% of two threatened reef-building coral species in the Caribbean. In spite of the devastating effects of the disease, a pathogen has not been identified. We aim to identify the cause of white band disease using infection experiments in order to develop methods of controlling disease outbreaks. 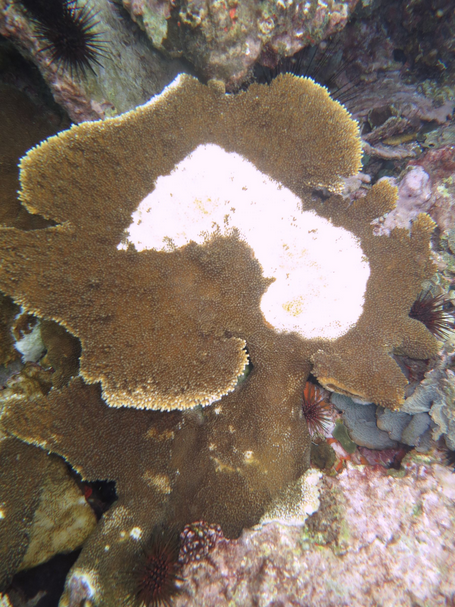 White band disease is one of the most destructive coral diseases, wiping out entire reefs of two important caribbean species: the staghorn (Acropora cervicornis) and elkhorn (Acropora palmata) corals. Both have been listed as threatened by the US endangered species act with a proposed upgrade to endangered status. 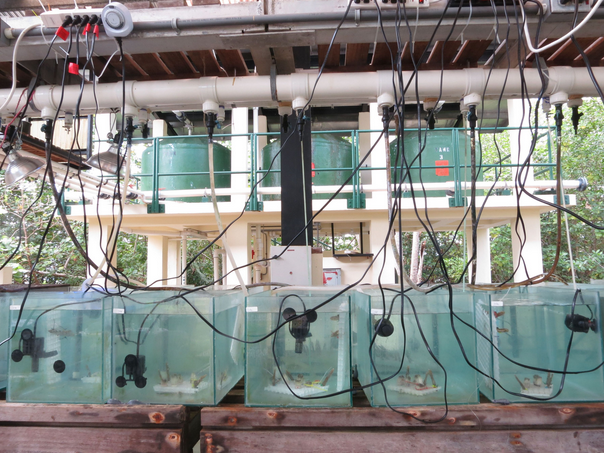 We have been working at the Smithsonian Tropical Research Institute (STRI) in Bocas del Toro, Panama for four years. Bocas del Toro is the ideal location to research Acropora as it is one of the last places in the Caribbean with intact Acroporid reefs. Through experiments conducted at STRI, we have discovered that the disease is bacterial (Kline and Vollmer), and that it can be transmitted by a coral eating snail and through the water (Gignoux-Wolfsohn et al). 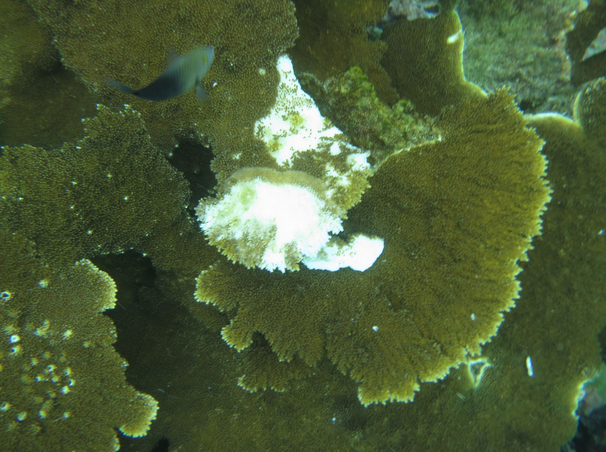 Recently, we have identified a number of species of bacteria that are more abundant in diseased corals using genetic surveys of diseased and healthy staghorn corals (Gignoux-Wolfsohn and Vollmer, in prep). What causes coral diseases is still poorly understood. Coral diseases are linked to increases in runoff from agriculture and rising ocean temperatures. Epidemics will therefore continue to increase with industrialization and global climate change. It is imperative that we gain a better understanding of which bacteria cause disease in coral and where these bacteria come from. An understanding of the causes of white band disease would contribute to our understanding of coral diseases as well as other marine diseases. Because they grow quickly (up to 15 cm/year), both species of Acropora are ideal candidates for reef restoration, and a number of foundations have been growing them to rebuild damaged reefs. White band disease continues to affect these nurseries. 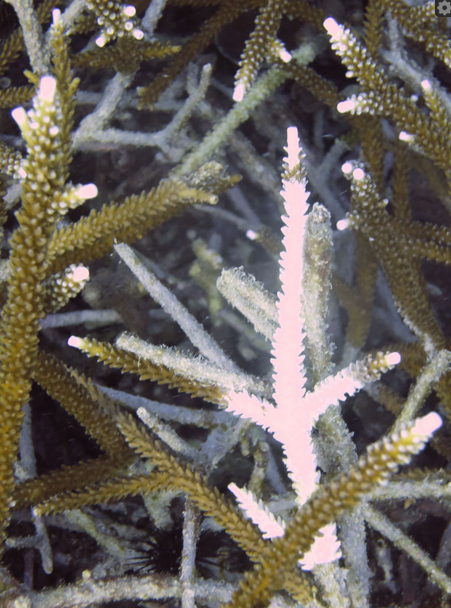 An understanding of the cause of white band disease would allow us to potentially treat not only corals in the wild but also those carefully harvested for restoration work. In addition, corals contain largely unexplored microbial communities, many of which have been shown to display antibiotic properties. A better understanding of the diversity of bacteria present on corals could contribute to the discovery of novel sources of antibiotics. 1. What antibiotics prevent white band disease transmission? 2. Which kinds of media promote the growth of the white band disease pathogen? We will expose healthy corals to disease slurries grown in different media that select for specific groups of bacteria and see if they contract disease. For example, if we grow a slurry in media specific for flavobacteria and it still transmits, we know the pathogen is likely in this group. Once we have established which media and antibiotics promote the growth of the pathogen, we will begin to test Koch's postulates by exposing healthy corals to individual strains that grow on the determined media/antibiotic combination that promotes white band disease and look for signs of disease. These experiments will allow us to take the list of candidate pathogens determined by large scale genetic screening and find which strain (or multiple strains) cause(s) white band disease. These funds will allow us to go to Bocas del Toro, Panama and conduct a research trip. The trip will include experiments in the wet lab and collection of samples that will allow us to isolate a white band disease pathogen. The funds will cover our flights down to panama as well as housing and lab expenses while at STRI. Lab work will include preservation of coral samples at various time points over the course of infection with white band disease. 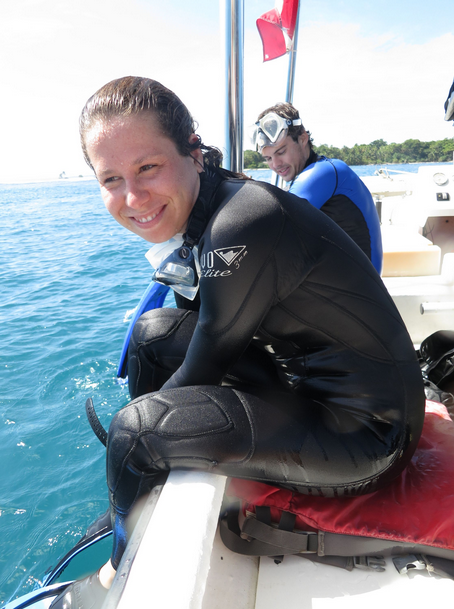 Sarah and Felicia's work on the disease ecology of staghorn and elkhorn corals will be money well-spent. The species they are working on are proposed for listing on the endangered species list. Figuring out how white band disease works is an extremely important first step in figuring out how to help these species survive. The laboratory and sites where they are working is the best possible location to tackle this important issue. They are both very creative scientists, and have boundless energy to solve this puzzle. From a childhood spent in tidepools in Maine to studying the health of the Connecticut river and learning genetic techniques as an undergraduate, many aspects of my life have prepared me for this project. I enjoy combining ecological studies with cutting edge genetic techniques. Working in the Caribbean, I have witnessed the decline of coral reefs and how important these reefs are for both local inhabitants and visitors. I believe strongly that more research needs to be done on why these ecosystems are dying and how we can help prevent their extinction. Growing up SCUBA diving in the Caribbean I spent hours observing and identifying any creature that crawled, swam, flew or hopped across my path. 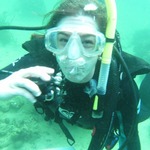 My love of marine ecology has taken me to complete field seasons from Maine to Malaysia to French Polynesia and ultimately back to the coral reefs of Panama. Together we can help save these important ecosystems. Growing up SCUBA diving in the Caribbean I spent hours observing and identifying any creature that crawled, swam, flew or hopped across my path. 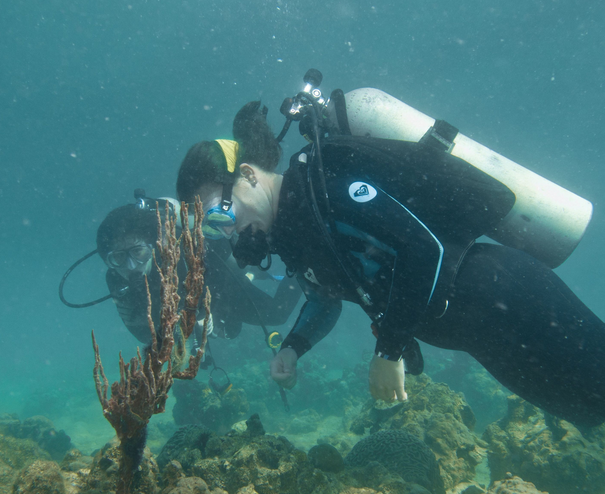 My love of marine ecology has taken me to complete field seasons from Maine to Malaysia to French Polynesia and ultimately back to the coral reefs of Panama. 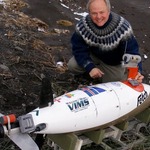 My research interests broadly lie in how ecological questions can be addressed using genetic tools. 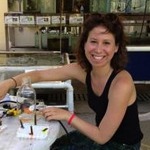 Specifically I enjoy exploring microbial community dynamics in coral host-pathogen systems, which I have worked on both in the Vollmer lab at Northeastern University and in the environmental engineering department at MIT. Getting back on the boat after a dive! 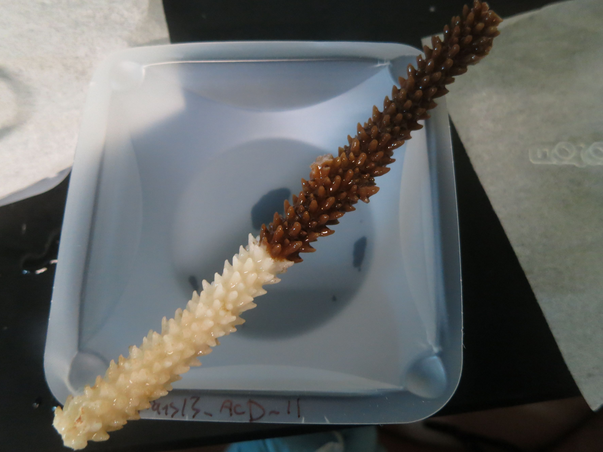 A fragment of white band disease infected Acropora cervicornis in the lab ready for preservation in DNA buffer. Looking for snails for an experiment. Infection experiment setup in the wetlab at STRI. White band disease on Acorpora palmata.